Power-Up Podcasting is a complete, step-by-step podcast training course designed to help you create and successfully launch a podcast. Pat takes you through planning, recording & editing, equipment, hosting, transcriptions, launch, and more! You’ll also get access to a private Facebook group and regular office hours. Pricing for Power-Up Podcasting is currently a one-time payment or three equal payments so you can fit your budget. Hint: You can save $100 by grabbing this Podcast Cheatsheet and signing up for Power-Up Podcasting within 3 days. I highly recommend learning more about it and seeing some of the feedback from his students. 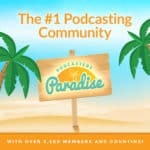 Podcasters’ Paradise is a podcast membership site with tons of resources for new and existing podcasters. Paradise has been around for a long time and there are over 3,000 existing members, including many well-known podcasters. Pricing is $97/month or $997/year. You can sign up for Podcasters’ Paradise here. JLD also has a couple of free podcast courses including this 10-day email and video course and a podcasting course podcast. The Podcast Success Academy is a put together by Mark Asquith and the team from Podcast Websites (one of my recommended podcast hosting companies). It includes a ton of videos, templates, and courses from many different big names in the industry. There are weekly office hours to get your questions answered, monthly mastermind sessions, quick win exercises, and more! Whether you’re looking to grow your podcast, learn how to monetize, how to start, edit, etc. – The Podcast Success Academy is an amazing value. They have a free plan and a growth accelerator tier if you want access to it all. 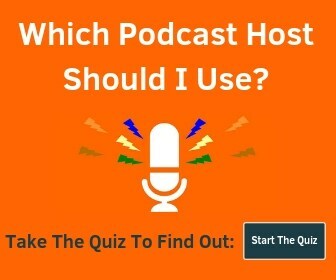 Buzzsprout recently released the How To Start A Podcast Podcast. Listen on your favorite podcast app or on their website. One of the best ways to grow a podcast is with successful blogging. It’s just easier to be found and shared with written content today. 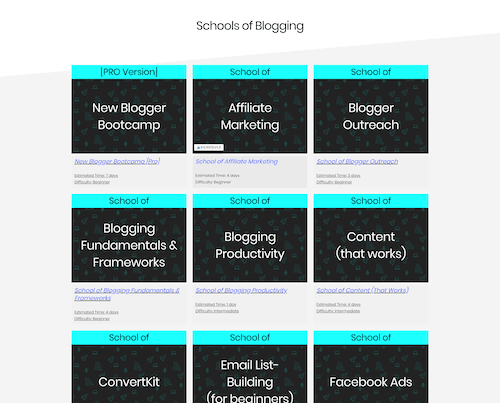 The best way to learn (and the best value) is to grab one of the BloggerU Bundles. There are beginner, intermediate, and the complete suite of courses so you can choose the bundle that fits your budget, level, and ambition. There is a great Slack community (that I’m apart of) to get questions answered – plus Pete runs a successful podcast as well. 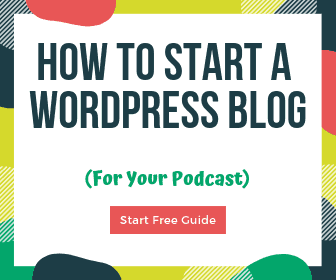 Check out our article on how to start a WordPress blog for your podcast. Mike Russel runs Music Radio Creative, a great place to get professional intros, outros, and jingles for your podcast. He created an easy to follow Adobe Audition for Beginners course on Udemy. Adobe Audition is one of the best software programs for recording and editing podcasts, and is part of the Creative Cloud suite. Not sure how their pricing and discounts work on Udemy, but when I look at it the price is $11.99 (down from $199.99). Audacity is commonly recommended for podcast editing. It’s free and available on both Windows and Mac. There is a free Start Learning Audacity course on Udemy, which is a great place to get started.